Dogs get bored, just like people, so our non-human animal companions benefit from the occasional mental challenge to keep them on their toes just like we do. Giving your Fuzzy Buddy a mental challenge can mean teaching them new behaviours like tricks and commands. It can also mean giving them other kinds of challenges. To keep life interesting for captive animals, zoos have come up with what they call “enrichment” programs, challenges to keep the animals in their care engaged in searching for their food as they would in their natural habitat. That’s also what I call it when I give my Fuzzy Buddies a similar challenge. 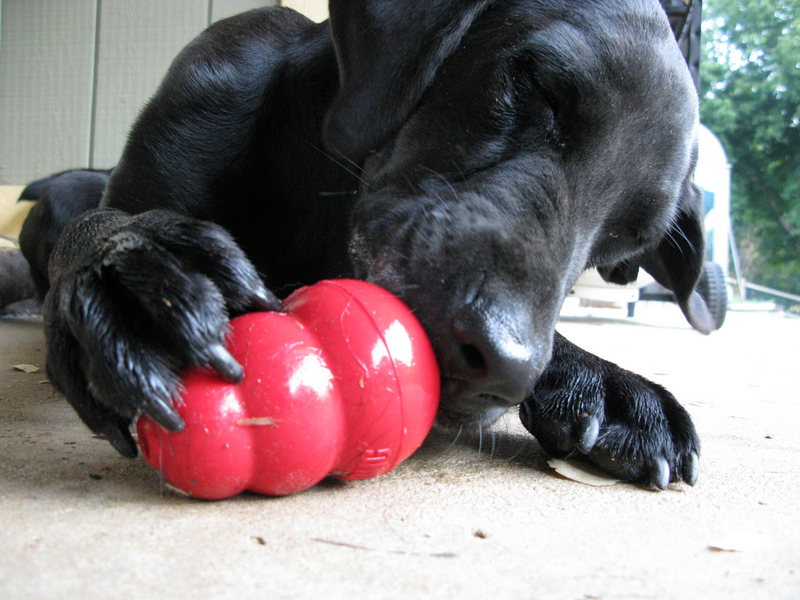 You’re probably familiar with treat-dispensing toys for dogs, which are specially created to give your dog a challenge and keep her brain focused by inserting treats that she then has to work to obtain. There are many toy brands on the market, probably the most recognizable being Kong, and they offer a wide variety of challenges with varying degrees of difficulty. In my experience, different dogs have different levels of commitment to a challenge like this and it’s not entirely correlated with their level of food motivation. Some stay at the task for a long time and others will give up after a short time and wander off. I made the mistake of helping one of my Fuzzy Buddies when she couldn’t get the cookie and after that she simply brought me the Kong whenever she became frustrated, dropped it at my feet, and looked at me expectantly. Oops, that wasn’t the point of the exercise! When I don’t have a Kong or similar toy available, or if a dog has mastered his toy and it no longer keeps him busy for long, I’ve gotten creative. While dog sitting in Costa Rica I bought a chilled, green coconut (pipa fria) and drank the juice. 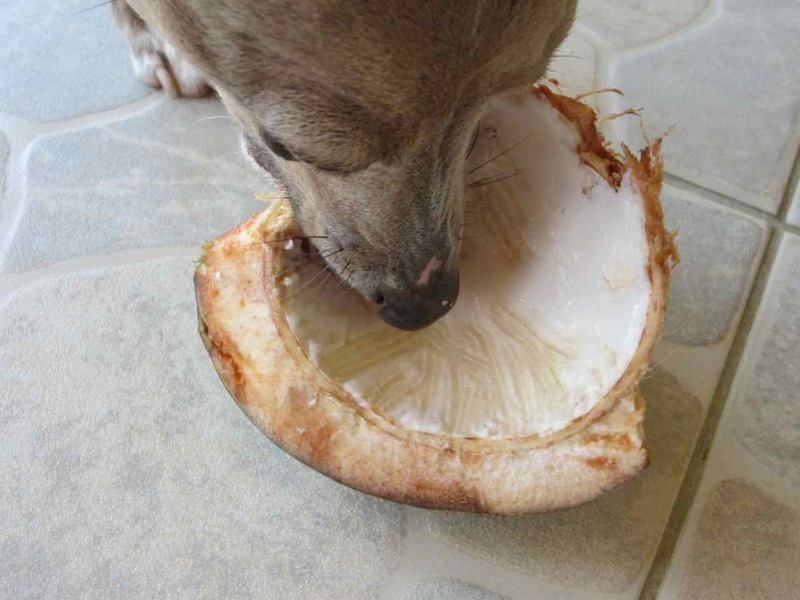 When I was finished, I cracked open the coconut with a machete and gave each of the dogs a large chunk. They loved it! Each trotted off to their own corner and set about devouring the inner layer of soft pulp. That little idea kept the dogs busy for quite a long time and added a new, interesting experience to their day. 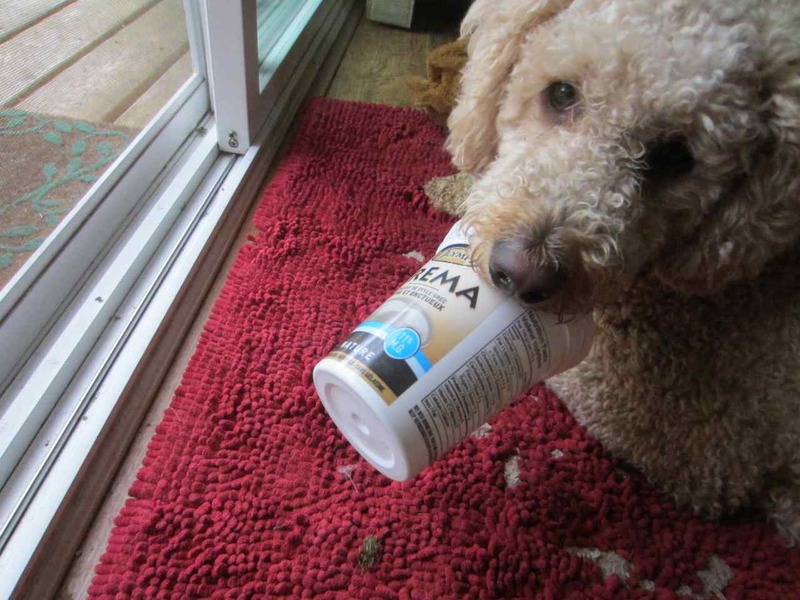 More recently there was a wee bit of yogurt in the bottom of a container I’d finished so I called over my Fuzzy Buddy Dakota, who is pretty expert at getting things out of his Kong. The task wasn’t so much challenging as it was novel and for that wee little skim of yogurt he got 20 minutes of mental activity he wouldn’t otherwise have enjoyed. Just like a new experience livens up our day, I believe it brightens up the routine for our Fuzzy Buddies, too. Note: Before offering your dog ANY kind of food, ensure it is not a food that is harmful to dogs.